Dr. Meyer and his staff will take records of the patient, including PVS impressions, intra and extra-oral photos and x-rays. The records are sent to Align Technology with the desired treatment goals. Plaster models are poured and then scanned to create a highly accurate digital image. Upon approval of the treatment, Align Technology manufacturers the customized Aligners and sends them to Dr. Meyer, along with any instructions and attachment templates required. 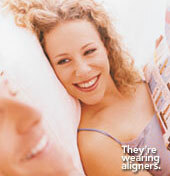 Sets of Aligners are then distributed to the patient at each appointment.